Food labels can provide a lot of useful information but at times they can be a little hard to make sense of. It's important to get to grips with them because they can help you make healthier food choices. Here, we guide you through some of the key things to look out for. What’s required to be on a food label is strictly governed by European law. Food manufacturers and retailers are legally obliged to put the following information on food labels. A list of ingredients, starting with the one there's most of. The weight or volume of the product. The name of the food – including a description for brand names. If a food has been processed, this must be stated on the label (for example, ‘smoked salmon’). Storage instructions telling you the best way to keep the food so it doesn’t go off. A use-by date so you know how long you can safely keep the food in the recommended storage conditions. Stick to the use-by date so you don’t get food poisoning – for more information, see our topic: Food safety. The best-before date is different. After this date, the food may lose some flavour or texture so it’s no longer at its ‘best’, but it’s unlikely to make you ill.
Clear instructions on how to prepare and cook the food if necessary. The manufacturer's name and address so you can find out more about the product. The place of origin so you can clearly see where the food has come from. It would be misleading not to show it – for example, a Greek-style yoghurt made in France. Any genetically modified (GM) ingredients. This doesn't apply to meat, milk or eggs that come from animals that have been fed with GM products. 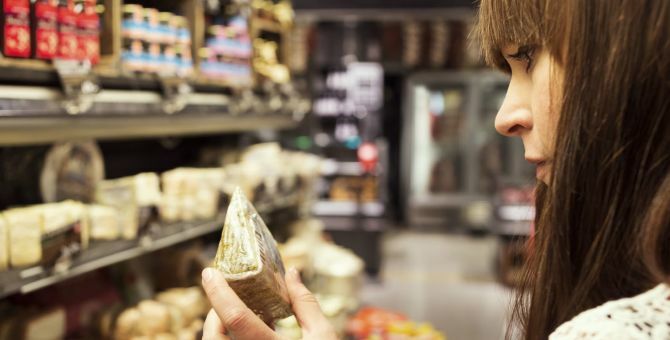 Labels for most pre-packed foods in the UK must show nutritional information. Food manufacturers are also required to show nutritional information on food labels for foods that make a health claim such as ‘low-fat’. This information is usually put in a table on the label on the back of the food. It can be really useful to help you shop more healthily. Nutritional information can also be displayed on the front of food packaging so you can immediately see how healthy it is. In the UK, the traffic light system is used to show this information. The idea is to choose more items with green lights and fewer with red lights. The label also shows the percentage of your reference intake (RI) a portion provides. This is usually the value for an average adult (unless it's a product for children). If foods make health claims, they need to meet the legal criteria for those claims. In order to claim that a product is fat-free, it has to contain no more than 0.5g of fat per 100g or 100ml of product. A solid food claiming to be low-fat, light or lite, can't contain more than 3g of fat per 100g. A liquid food making this claim can’t contain more than 1.5g of fat per 100ml. To claim a product is reduced saturated fat, the amount of saturated fatty acids and of trans-fatty acids in the product must be at least 30% less than in a similar product (ie the full fat version). And the trans-fatty acids content in the product must be equal to or less than in a similar product. Low-sugar foods can’t contain more than 5g of sugars per 100g (if solid) or 2.5g of sugars per 100ml (if liquid). To claim there is no added sugar, the product mustn’t contain any added monosaccharides or disaccharides or any other food used for its sweetening properties. We explain the different words for sugar below. If sugars naturally occur in the food, the label should also say, ‘contains naturally occurring sugars’. A food claiming to be low in salt mustn’t contain more than 0.12g of sodium per 100g or 100ml of product. This equates to 0.3g of salt per 100g or 100ml of product. Very low-salt products can’t contain more than 0.04g of sodium (0.1g salt) per 100g or 100ml of product. You can read more about how much salt we need in our diet in the topic: Salt. For tips and advice on how to cut down, see our blog: How to eat less salt and add more flavour! If you’re pregnant, it’s more important than ever to have a healthy diet, both for you and your developing baby.